Swing Des Moines helped out at an event at Iowa Christian Academy last weekend – their jazz band played a swing dance for the students and parents. We taught a lesson to kick off the night. It was super fun, and the student band was great to dance to! More pictures here. As a leader, your role is to make your partner look good and ensure that she leaves the dance floor in the same condition as she entered it. Dancing with many different partners, although initially scary, is crucial for improving your lead-follow and general dancing skills. Have fun. Smile. Swing dancing is supposed to be fun, not a chore. The above list isn’t comprehensive, but I’d like to focus on another very simple rule of thumb: your job is not only to have fun, but to ensure that you don’t prevent others from having fun too. The example I’m going to share didn’t come from our monthly swing dance, Jive Junction (3rd Friday of every month), fortunately. The case in point was at an event during the last month or so. The music was good, but the number of dancers probably exceeded the available dance space. Most of the dancers took a cue from this and danced small. A very talented couple were able to show some fancy lindy hop moves when the dance floor was less crowded, but otherwise kept their partners near and safe. Another couple just didn’t get it. They were all a-smiles and having a great time showing off wild and crazy steps… into every pair around them. I was jabbed with an elbow to the side and a nasty kick to my achilles tendon as I tried to shield my partner from them. It was very obvious they were having fun, but totally oblivious to the couples actually cowering from them. Nor did they ever apologize to anyone they struck. My wife actually asked me to send her in their direction because she was prepared to trip them…. (which, shamefully, I considered). Instead, we walked off the dance floor in the middle of the song (literally), put on our street shoes, and left. Anyone who knows me knows that I rarely (never) leave a dance early, but I was through. Luckily Swing Des Moines members, and those that attend our functions, are very conscious of people around them. Sure, there’s an occasional bump or kick when two leaders send their partner into a space which was empty a few seconds earlier. But there’s always a quick “sorry” or “oops”. It’s funny how life circles back on you. My wife and I took a jitterbug class taught by Swing Des Moines instructors in the fall of 2005 which was part of the West Des Moines Adult Education program. Three years later and we’re teaching the class… and loving every minute of it. This past weekend, I was talking with two attendees of the Swingin’ at the Crossroads workshop over dinner. They asked us how we got interested in swing dancing. I told the story of how I enthusiastically reluctantly attended the first lesson that Janet had enrolled us both in. 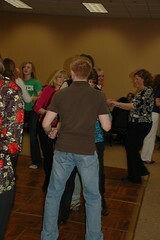 There we all were, about 10-12 couples, apprehensively encircling a pair of SWING DANCERS who were there to teach us. They were encouraging and gentle with us. And after the first lesson, I was hooked…. There’s something special about swing dancing. I’ve described it to my friends as a guilty pleasure and as a secret language. 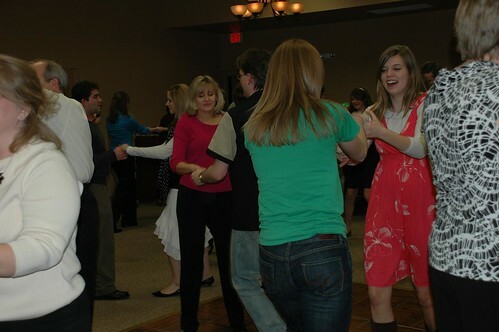 There’s a joy in it — you can’t lindy or jitterbug or collegiate shag or Charleston without a smile on your face. 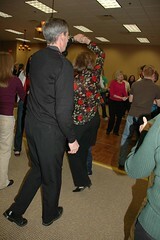 A dance like Swing Des Moines’ own monthly Jive Junction (third Friday of every month) leaves me energized for hours. Teaching a jitterbug class is yet another joy. At the first fall class we asked the each couple to tell us who was there “under duress” and there were several men who admitted that their partner “just told me I was coming”. It’s the circle of life. And it is wonderful to be part of the chain from teacher to student to teacher. At least one couple braved their first Jive Junction in October while still taking their first swing class ever, just like we did three years ago. They, too, claimed a darker corner of the dance floor to practice their jitterbug steps and turns. 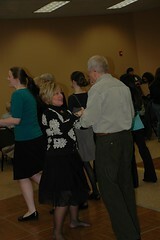 And, although she may have been nervous to dance with “the teacher”, she did anyway….and was a GREAT partner.